Indians travelling to Bhutan don�t need a visa or a passport to enter the country. Just an Identity card is enough. This is owing to a special treaty with India. This definitely gives a boom to the influx of tourists from India due to its ease of travel and not being treated as tourists, and like one of the locals. The Bhutanese people, like the Indians, are very courteous, warm, hospitable, and god fearing. To keep their country isolated and preserved as an eco friendly destination, the tourism policy of Bhutan focuses on Low volume tourism. As a tourist, you need to be on a pre-arranged itinerary by a tour operator recognized by Tourism Authority of Bhutan. It�s a duty of a tour operator to arrange everything in advance for a tourist planning to go Bhutan including visa clearance number. 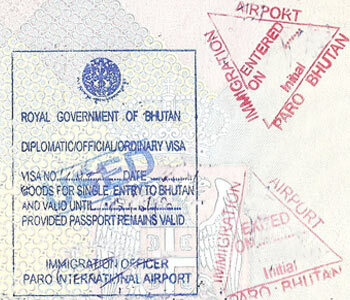 Your visa will get stamped on arrival in Bhutan. If you are planning to travel Bhutan by road, then your visa will get stamped at Phuentsholing, which is considered as an entry point to enter Bhutan by road. Foreigners are required to pay a fee of $20 which is valid for upto 14 days of arrival time. As a tourist, you need to carry two copies of your original passport size photographs with you. All the above policies are strictly followed in Bhutan as directed by Tourism Authority of the nation. This is primarily done to protect both the people and the economy from the influence of the western world. Only the passionate travelers get an edge over the rest, by bountifully organizing their trip to this beautiful garden of the world. They intend maintaining the flora and fauna by avoiding access of commercialization of the fast-paced world. This is what attracts the tourists to this exclusive country. The beautiful snow-peaked mountains beckon you to the higher regions and of course at times to Thimphu too. Though there are times, when the roads are closed due to heaven snow. The most favorite months to visit Bhutan for touring and trekking are March to May. The prettiest of flowers like the rhododendrons, magnolias, and other wild flowers are at its full bloom. The most popular time though in Thimphu is during the dance festival called the Thimpu tsechu, which is held in autumns, and there is one which is held in Paro which is held in spring. These bright festivals give you an insight into the colorful lives and culture of the Bhutanese. One of the festivals in Bhutan is a must do. Cultural events are given special importance by the government and the people of Bhutan. Nationals of Indian, Bangladesh and Maldives can obtain a visa on arrival. Permanent Residents of these three neighbouring countries only need to carry a valid identity proof or Voters Identity Card with them for traveling to Bhutan. All other foreign nationals apart from Indian, Bangladesh and Maldives are required to obtain a visa clearance prior to their travel. All the visas are then processed by a recognized tour operator directly or through an agent. As a tourist, you need to submit a photo-page of your valid passport to your concerned tour operator who will then apply for your visa. Tourism Council of Bhutan will only proceed with your visa clearance after receiving a visa fee of USD $40. Once your visa is clear, you are required to show your visa clearance letter at the airport on arrival.